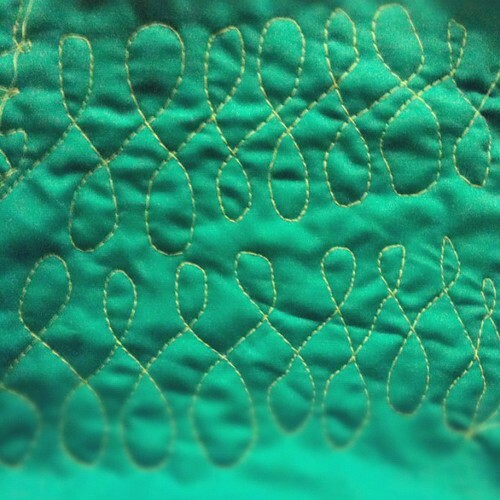 When I can’t sleep, which has been par for the course the last week or two (I usually pass out at 7:30 – 8 while putting the kiddos to bed then wake up around 1 or so gearing to go), I watch YouTube videos of free motion quilting and then practice, practice, practice. FMQ is one of those things that looks so easy when other people do it yet I’ve always found it intimidating. Now, it’s all I wanna do. So far it’s been like drawing with my machine, which is great. I love to draw. I love to sew. And these late-night doodlings on fabric have been especially satisfying because there’s something so wonderful about the very act of sewing. I enjoy the process immensely. Finally warmed up, I figured I would try it with one of the tops I have that needed quilting. There is a world of difference between doing it on small and manageable scraps, which I totally got the hang of and was starting to see significant improvement, and a larger quilt, which was a whole lot harder to maneuver. I get the gist of how to roll and hold the quilt, but it just doesn’t feel natural to me, and I struggled with getting my curves right because I had trouble with holding the quilt. Maybe I was trying to make the loops too large? It felt more controlled and I got neater results when I made smaller shapes. I had to play around with the tension, and my stitches were so not even because I was moving faster than the machine (derf). So I really had to practice what I preach to my students and be patient with myself and accept the fact that I was not going to get perfect FMQ results on my first top. But practice does make perfect, or at least, much, much better. There’s going to be more FMQ in my future, including a class I hope to take soon. In the meanwhile, I’m going to keep playing with it. There are feathers to be sewn, dagnabbit!